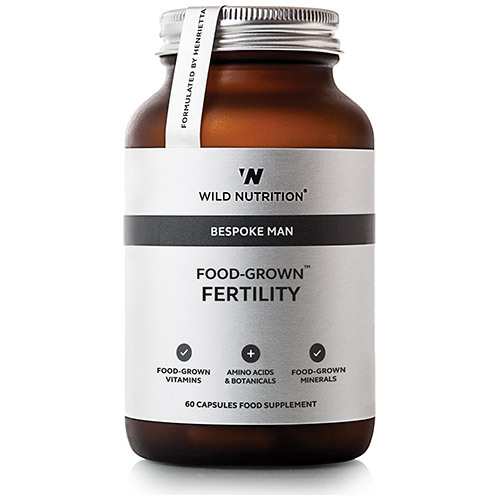 Wild Nutrition’s Food-Grown Fertility for men is a comprehensive blend of Food-Grown nutrients and whole-food concentrates expertly formulated to support preconception. This unique formulation focuses on key ingredients demonstrated through research to support healthy conception. These include; zinc, shown to contribute to normal fertility and the maintainence of healthy testosterone levels in the blood; selenium, shown to promote normal spermatogenesis; vitamin B12, iron, magnesium and vitamin D for normal cell division and antioxidants such as vitamin E, beta-carotene, pycnogenol and lycopene to support protection against oxidative damage. The Food Grown Fertility also has the added support of other key ingredients; inositol, choline, n-acetyl cysteine, co-enzyme Q10, amino acids l-carnitine and l-arginine to promote sperm count and motility. Cordyceps sinensis powder provides extra support during a time of potentially greater physiological and psychological demand. Vitamin C incorporated in Citrus pulp; Mineral enhanced Yeast providing Thiamin, Riboflavin, Vitamin B6, Vitamin B12, Vitamin D3, GTF Chromium, Calcium, Magnesium, Copper, Selenium, Zinc, Niacin, Molybdenum, Vitamin E, Biotin, Choline, Inositol, Boron, Iron, Manganese, Pantothenic Acid, L-Arginine, Pro-natured CoEnzyme Q10 and L-Carnitine, Folic Acid, and Vitamin K, incorporated in Alfafa concentrate; Beta-Carotene incorperated in Carrot concentrate, Lycopene from Blakeslea Trispora. N-Acetyl Cysteine, Cordyceps Sinensis Powder and French maritime pine bark extract (Pycnogenol), Vegetable Cellulose, (capsule shell) . Take 2 vegicaps per day with or without food. If you are taking medication or under medical supervision, please consult your healthcare practitioner before taking any food supplement. Below are reviews of Wild Nutrition Fertility for Men - 60 Vegicaps by bodykind customers. If you have tried this product we'd love to hear what you think so please leave a review.